Think you know stickers? Chibitronics makes stickers like you’ve never seen before. 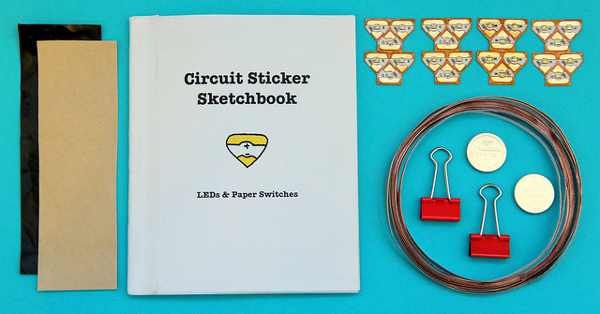 These ingenious stickers bring electronics and crafts together and the results are spectactular. Solder-free and adhesive-backed, these stickers are flexible circuit pieces you can use to really light up cards, drawings and scrapbooks. The secret behind these magical stickers is the conductive adhesive that connects the sticker to the circuit.They stick to any surface – paper, fabric, glass. Go on, I dare you to be inventive. Create the circuit and make it part of a drawing or highlight some points in your notes. Kids will love this novelty and use it over and over again. And these creative stickers are just as fun for kids as they are for adults. The clever minds behind Chibitronics – Bunnie, a programmer from Studio Kosagi, and Jie Qi, from the Massachusetts Institute of Technology media lab –also make colour LED stickers, sensor stickers and pre-programmed pattern stickers that fade and blink. To order these stickers, pledges can be made to Chibitronics’ crowdfunding campaign on Crowd Supply. The starter kit costs $25 and includes twelve white LED stickers, six each of red, yellow, and blue LED stickers, one 5m roll of copper tape, two coin batteries, two small binder clips, one swatch of conductive plastic, one swatch of Z-conductive tape and a copy of the “Circuit Sticker Sketchbook” by Jie Qi, an introductory guide to using circuit stickers. The deluxe kit costs $89, add-on effects are $15 and add-on sensors are $25. Crowd Supply ships worldwide.